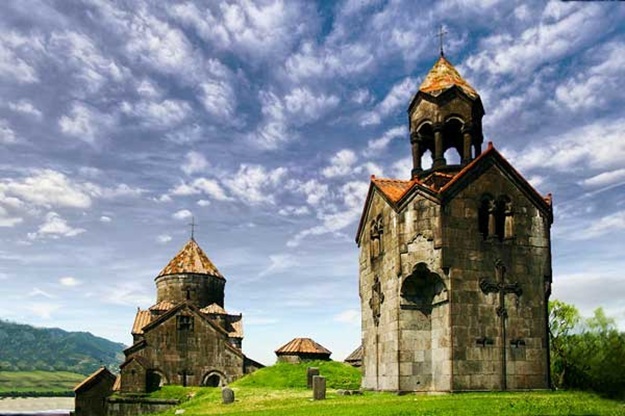 Many times was the Haghpat monastery ruined, robbed and divested by foreign invaders. During the Seljuk campaign in the 12th century part of the manuscripts was concealed in the caves by the monks. The saved ones are demonstrated today in Matenadaran.The Haghpat complex includes the large refectory covering a surface of 340 m2, the largest one in Armenia. In the 1245 the sophisticated bell tower was built. In 1257 father Hamazasp built a large chapel that was later called Hamazasp’s House. The complex also comprises the tiny St. Gregory church (1005) and the St. Virgin chapel (13th century). The porch of St. Neshan church also refers to the same historic period. A number of cross-stones stand in the backyard, the most famous of which is “The Savior” reflecting the scene of crucifixion and other Biblical motifs. 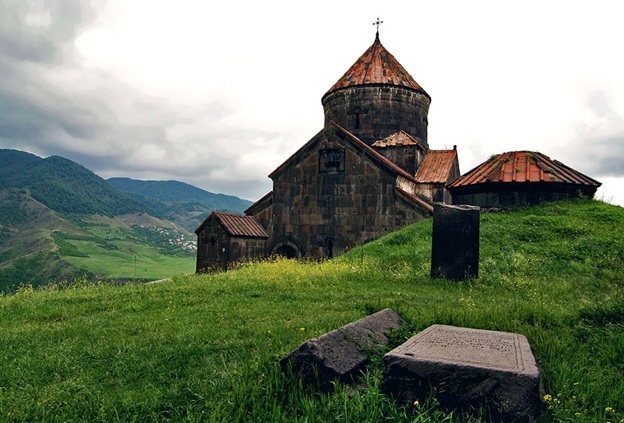 Construction of the main church of the large fortified monastic complex of Haghpat, dedicated to the Holy Cross, began in 966-67 and was completed in 991. The central dome rests on the four massive pillars in the side walls. The external walls are almost entirely covered by triangular niches. The apse contains a fresco of Christ Pantocrator. The building is complete and in its original form, apart from some 11th- and 12th-century restorations, including the large gavit through which access is gained to the church. The plan of the gavit, built in the second decade of the 13th century, differs markedly in style from the main church. A large narthex-type building used for meetings, teaching and funerary rituals is based on vernacular architecture in wood, with the roof supported on four pillars in the centre of the structure. Vaulting divides the interior of the roof into nine sections, the central one of which (yerdik ) is the highest and dominates the interior space, as well as illuminating it. 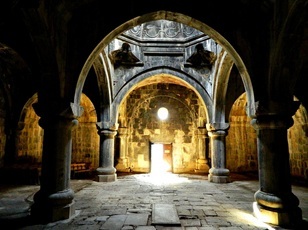 The church is joined by a vaulted passage to a large jamatoun(chapter house), in the same style as the gavit, built in the 13th century. Also connected to the church is the library, a compact square building dating back to the 12th century.